Where is N.C.'s 'Down East'? A recent column on the art and craft of wooden boatbuilding mentioned "Down East" North Carolina and referred to it as that part of the state on the yon side of the lower Neuse River -- and communities such as Davis, Stacy and Atlantic. (I know: Maine has its own Down East, and fine boatbuilders, too.) Like most North Carolinians, I've heard the term applied to a much larger area of the Eastern N.C., but I believe it most accurately describes a particular section north of Cape Lookout and west of Core Sound, including Core Sound. If it had a capital, it would be Harkers Island. But like all good things North Carolinian, it's a matter of some contention. Barbecue, for example. I really enjoyed your column the other day, but I have questions about your definition of Down East. Does it really begin east of the Neuse River? I'm not sure. As a native of Goldsboro and a 23-year veteran of the Claude Sitton era News & Observer (where we had such discussions many times a day! ), I always believed it to be anything east of Raleigh. Course, you have your view and I have mine. You are indeed the fella who swears the best North Carolina barbecue is available in Henderson. Har! Let's have lunch sometime. "In North Carolina, "Down East" historically refers to the group of communities east of Beaufort in Carteret County in the Coastal Plain region of the state. The residents of Down East Carteret County have referred to their group of communities by this name for many decades, but recently that the media has broadened this term to encompass the central Coastal Plains region of the state. Many residents of these communities feature a High tider accent, a dialect remnant of Elizabethan English that was once spoken in colonial Carolina. This dialect is indigenous to the lowland areas of North Carolina, in combination with the general southern accent of the Southeastern region." Now, as to barbecue: I haven't looked at it in awhile but I believe I said the best combination of barbecue, slaw, puppies, Brunswick stew and other trimmings is at (or was) at Nunnery Freeman in Henderson. But what you missed is that I said the best barbecue in North Carolina is at Wilber's in Goldsboro. 'Course, that's a distinction that would probably go right over Claude's head, too, he being a Georgian now, and all. "If the question is best barbecue, period, then my answer is Wilber Shirley's peppery, chopped barbecue cooked the old way - over hardwood coals just behind his one-story red-brick restaurant on Goldsboro's east side. They sell a ton of barbecue here because it's done right. There's atmosphere, too, which is not that common in barbecue restaurants. Wilber keeps pictures of Franklin Delano Roosevelt and Jimmy Valvano to remind you that he's a Democrat and an N.C. State fan. The barbecue is first rate, and so is the barbecued chicken. There are those who'll argue it's the best barbecue joint in the South, though others say another Goldsboro joint, Scott's, is even better. But I stop at Wilber's. The meat is a highly flavored, darker brown barbecue you won't soon forget." Happy to hear from you and to correct the record! Patricia Sullivan was among the most memorable university presidents I've met in more than 40 years of covering North Carolina.PHOTO She had a rare combination of institutional vision, an uncanny common sense and, perhaps rarer yet, a warm personality that made her instant friends with students, alumni and ordinary folks all over this old state. Even more remarkably, she was the first woman to be chancellor at what is now the University of North Carolina at Greensboro, but which for most of its existence was known as a college for women. When I was growing up in Greensboro it was known at Woman's College -- W.C. for short -- and it long had attracted the best female students in the region. It underwent quite a transition from the 1960s through the 1980s when barriers fell and women could attend any college they wished. But when Sullivan became UNCG's first female leader in 1995, folks wondered why they had waited so long to put a woman in charge. She was truly outstanding. Joe Killian, a writer at my old newspaper the Greensboro News & Record, has a good assessment of her work over 14 years at the Greensboro campus. She had retired in 2008. 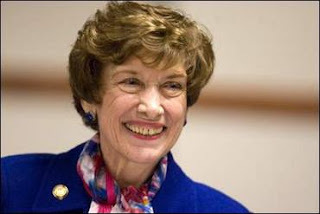 Her death Thursday at age 69 from pancreatic cancer came as a shock because she had been so vigorous as a campus leader -- a notoriously hard worker who took an excellent university and made it outstanding, overseeing a 36 percent growth in enrollment while she was chancellor and transforming a very nice campus into a lovely academic enclave. But I think it was her personal attributes that won her so many admirers and built so much support for UNCG. She genuinely liked people, remembered their names and when she turned that toothy smile on you, the character lines in her face radiating exceptional warmth, the day always seemed to brighten. She is a reminder of this truth about the University of North Carolina system: it has done much for the people of our state, and it has brought us new leadership and new energy that have made us better. Why is N.C. Senate delegation so anonymous? Time was when North Carolina probably had one of the most recognizable Senate delegations in the country. That's purely conjecture on my part, but in 1973 and 1974, North Carolina was represented in the U.S. Senate by two persons often in the news. One was U.S. Sen. Sam Ervin, a Democrat, who was well-known in Washington and recently famous nationally for his role in chairing the Senate's investigation into the re-election campaign of President Richard Nixon. It was Ervin's Senate Select Committee on Presidential Campaign Activities that exposed much of the dirty tricks of the 1972 presidential election and the break-in at the Watergate Hotel, and which led to the constitutional confrontation that resulted in Nixon's resignation after the Supreme Court ruled he had to give up the White House tapes that showed his own involvement in a coverup. And the other was U.S. Sen. Jesse Helms, R-N.C., locally famous in his own right as a popular conservative broadcaster on WRAL TV in Raleigh and the first Republican to be elected to the Senate from North Carolina in the 20th Century. Helms went on to become even more famous, mastering the rules of the Senate, tieing it into parliamentary knots from time to time and helping elect Ronald Reagan to the White House. He rejuvenated the conservative cause nationally and transformed electoral politics with his fund-raising and advertising methods. It's been a while since the state's Senate delegation was so recognizable. And with the retirement of Helms from the Senate seven years ago, the state's delegation is the least recognizable in the nation. One reason for the state's poor showing may be that no politician from this state has been able to hang onto a Senate seat for longer than one term. Since Ervin the names of one-terms have been Democrat Robert Morgan, Republican John East, Republican Jim Broyhill (an appointee after East's suicide), Democrat Terry Sanford, Republican Lauch Faircloth, Democrat John Edwards and now Republican Richard Burr. After Helms left, Republican Elizabeth Dole served a term and last election lost to Democrat Kay Hagan. 1) Other than Jesse Helms, we just don't keep Senators around in North Carolina. He's the only one to be reelected since 1968. So voters just don't have time to become all that familiar with the folks they elect and then defeat six years later. The other two states at the top of this list- Colorado and Delaware- each have a Senator who was appointed rather than popularly elected. And the state with the most well known delegation- West Virginia- has two Senators with a total tenure of more than 75 years. There's not much doubt that longevity matters. 2) The other reason is that whether we think of ourselves as such or not, we are a big state! And Senators in big states tend to have a harder time getting the voters familiar with them because there is so much more ground to cover. It's no coincidence that beyond the two states with appointed Senators the next three states with the least well known delegations are New Jersey, Ohio, and Illinois, all among the 11 most populous states. Unless Richard Burr and Kay Hagan can break the state's recent trend, get reelected, and stay around a while North Carolina will continue to have one of the most anonymous- and ultimately least powerful- delegations in the US Senate. We sure aren't building much seniority. Your column reminded me of one of my favorite political stories. Robert Maestri was mayor of New Orleans in the mid-30s, an ally of the Long family but not what you would call a charismatic leader. Franklin Roosevelt visited the city, and Maestri joined him for dinner at Antoine's in the French Quarter. Not exactly sure how to converse with the president, Maetri blurted out in his best New Orleans accent, "How ya like dem eyrsters?" My home is in Belhaven, but since the 40s I have been away for the most part. Over the past few years I have made visits there and have seen things I never did see when I was growing up and it makes me think water quality is improving. In a recent trip I saw many pelicans and I never saw a one there before. Dolphins have been coming up the Pungo with regularity, I'm told. I saw a group in the 60s or 70s. I don't think they would hang out in nasty water. One thing may have been a contributor. In the 60s and before, the sound and river were dredged with large rigs for crabs. I went out a couple of times on a crab boat. Those nets literally dragged the bottom of everything present including logs, grass and worlds of small fish and stirred up a world of sand. I thought at the time this practice is destroying the fish nursery. In the interim period the dredging practice was stopped and I believe that has helped immensely. And I believe that accounts for the presence pelicans but I may be wrong on that. I figured if there wasn't food around they wouldn't be there. So maybe water quality is improving--I hope so. When I was a youngun oysters were plentiful in Belhaven and my Daddy dearly loved to eat them raw with vinegar. I still have his oyster knife. Maybe before I check out it will be possible to eat a mess of Rose Bay oysters again. Thanks for the piece on the above. Good steamed oysters, or even bad ones, are truly a Godsend. Mummmm, that was a good one! Definitely my favorite food as well. And so encouraging to learn that there’s a serious effort at oyster restoration underway down east. Support fast company. Eat Oysters. grace writing about it for the Charlotte Observer readers. The day the 2009 legislative session ended, Gov. Bev Perdue said that tax reform will be a priority for her next year. Mark Binker, capital correspondent for the Greensboro News & Record, reports on his blog that Perdue regards revenue restructuring as "a huge must-do for me." This is an important key toward updating the state's revenue system. Here are some additional things I outlined in Sunday's column that are needed. House Speaker Joe Hackney says it will take Perdue's support to get it passed -- though of course it will take his support, too. He has not been enthusiastic about it before. And it will need to be revenue neutral, he has said. It would also be helpful to have bipartisan support, but right now that seems unlikely to develop, considering how sharply divided Democrats and Republicans were on how to write the 2009-10 budget in this past session. That broke on such a strong partisan line that it would be hard to imagine circumstances that would bring the GOP to the table. In addition, next year is an election year for legislators. Anybody out there think that will help things along? Obama below 50% in N.C.
President Obama's popularity in North Carolina continues to decline and now is below the 50 percent threshhold, says Public Policy Polling analyst Tom Jensen. Jensen says only 46 percent of N.C. voters approve, while 47 percent disapprove. It was up around 54 percent just four months ago. Lest there was any doubt he has lost his star with African American voters, 80% gave him an 8 or a 9. More voters now disapprove than approve of Obama in every section of the state with the exception of the Triangle, where his 58/36 approval spread props up his overall numbers. We've seen some interesting wildlife in our neighborhood in the 32 years we've lived here in what's now called Midtown Raleigh. When first we came this neighborhood was up on the north side, but as folks have moved in, the city has become part of a sprawling metro area. Our wildlife in our first years included the occasional doe who lost her way from a nearby greenway, and for a long time we had an annual visitation of ducks and Canada geese hunting for a lake two blocks to our south that was drained years ago when the dam got sketchy. Two years ago we were joined by a hoot owl whose profile we occasionally would catch in the dim evening and morning light. And in June an impressive hawk took up residence briefly in a towering pine in our backyard. We met some of our new neighbors while standing in our driveway with binoculars trying to figure out what it was. My money was on a red-tail hawk, but that may just be because I like the sound of "red-tail hawk." A few weeks ago we heard from a neighbor two blocks over that foxes had moved in and that they were becoming aggressive, with a harsh, high-pitched bark. I thought nothing more about it until this morning's early morning walk. Sadie, a French Brittany Spaniel, and I were walking up the hill when we heard what I thought was a terrier with a summer cold hacking at us. Sadie whirled around and gave it her best big-girl bark, and the sick terrier turned tail and skedaddled. Only it had a long tail unlike any I had ever seen on a terrier. As we came back around our neighborhood 20 minutes later, the gloom had lightened a little, and we stopped and watched in fascination as two foxes scampered silently across the street right in front of us and headed down toward Doc Whitehurst's place. It was too dim to see what color they were, but the tails told the tale. It reminded me of the Country Gentleman's bittersweet bluegrass lament about a lost love, with the poignant refrain, "Like a fox on the run." RALEIGH, N.C. - North Carolina Gov. Beverly Perdue's administration lost a battle in its struggle to win a federal license to operate a series of dams Alcoa Inc. controlled for decades. The state House voted 66-39 on Thursday to reject creating a state corporation that would acquire and control the four dams on the Yadkin River. Perdue's administration is fighting Alcoa's effort to renew a federal license it held since 1958 to operate the dams, which powered an aluminum plant that once employed hundreds. The plant is closed, but Alcoa earns millions of dollars selling the electricity. Alcoa's opponents say another big issue is who will control the water supplying 2 million residents for decades. 2 p.m. addition: David Kochman, spokesperson for Gov. Bev Perdue, notes that the vote of the House does not affect the governor's intervention in the Federal Energy Regulatory Commission case and her opposition to a new license for Alcoa. If the license is denied, there will still be a process to figure out what happens to the hydro dams and the other issues involved in this case, he said. He is right, though the attorney general's office told a House committee not long ago that it would be helpful in challenging the license renewal in Washington if the legislature approved the Yadkin River Trust bill. "Legislators sent a clear message that they do not support the taking of private business. The more they learned about this issue, it became evident that passing this legislation would set a dangerous precedent for North Carolina. We appreciate the strong support of the N.C. House and remain committed to fighting any future efforts by Gov. Perdue to take our business against our will." * Alcoa began operating these dams in 1915, more than 40 years before it received the license in 1958. Under North Carolina law, Alcoa has riparian rights that allow for the “reasonable use” of water that crosses its property. The generation of clean, renewable energy is a reasonable use. * Alcoa doesn’t claim to own the water, and its hydro operations don’t consume the water. The water isn’t valuable as a fuel source without the dams that Alcoa built. * There is a takeover clause that gives the federal government the right to take over the project. But the federal government hasn’t expressed any interest in taking the Yadkin Project, and the time for recapture passed nearly three years ago. The federal government has never taken over a project in US history. *Alcoa’s hydro operations are highly regulated by the Federal Energy Regulatory Commission. The only difference between Alcoa and the public utilities is the oversight the Public Utilities Commission provides because Duke and Progress sell into the retail market vs. the wholesale. No one has ever said what they would have Alcoa do differently if it were regulated by the state. · PCB data has been collected on fish in Badin Lake, other North Carolina reservoirs and other reservoirs around the United States. · The PCB concentrations in fish in Badin Lake are very similar to or identical with fish collected by EPA in the National Lake Fish Tissue study from other North Carolina reservoirs. You never know what’s going to happen when you’re at the legislature. And Wednesday was one of the most surreal days I’ve ever experienced. One week after a N.C. House Committee voted against a government takeover of the Alcoa’s Yadkin Hydroelectric Project, that same committee resurrected the bill and voted 8-7 to support an unprecedented government takeover that could cost North Carolina taxpayers more than $500 million. The House Water Resources & Infrastructure Committee narrowly approved Senate Bill 967 despite the anticipated cost and strong opposition from lakefront homeowners, property rights advocates and local officials in Stanly County. Within hours, Sen. Fletcher Hartsell began maneuvering the bill for a quick passage in both chambers. He amended an existing bill (House Bill 1099) to include the essence of SB 967 that creates the Yadkin Trust. The bill passed the Senate and was sent by special delivery to the House for a floor vote that could occur as early as tomorrow, effectively bypassing the House Public Utilities and House Finance committees. At the same time, SB 967 was referred to the House Public Utilities Commission for a hearing on Thursday at 10am. This essentially gives the bill's supporters two different cracks at passing the Yadkin Trust bill. If SB 967 is defeated in committee, the full House can still pass HB 1099. Alcoa will continue fighting to keep the Yadkin Project, which has generated clean, renewable energy in North Carolina for nearly 100 years. It is important to remember that regardless of what happens in the North Carolina legislature, only the federal government can consider a takeover of the Yadkin Project, Ellis said. The Federal Energy Regulatory Commission (FERC) has all of the information it needs to issue a new long-term license for the Yadkin Project. FERC staff has already dismissed the possibility of a government takeover and recommended issuing a new license to Alcoa. On a dramatic 8-7 vote, the House Water Resources and Infrastructure Committee approved a revised bill that would create a Yadkin River Trust to purchase and operate the Yadkin River hydroelectric plants for which Alcoa Power Generating Inc. is seeking a new federal license. A week ago, the bill stalled on an 8-6 vote, but the revised bill passed narrowly. Now there's talk of putting the revised bill into Senate legislation as the legislature moves toward a close. There's lots happening on this. What's really interesting is that a few weeks ago House Speaker Joe Hackney wasn't sure if there'd be time in the closing days of the legislature to pass a version of the Senate-passed bill. Now it's closer to passage before the legislature adjourns. That's quite a turnaround. Alcoa was oh-so-close to getting a renewal of its federal power license from the Federal Energy Regulatory Commission until a bipartisan group of legislators got interested in engineering what's called a recapture of the dams, as federal law allows. Gov. Bev Perdue opposes the license renewal too and has intervened in the federal case. Alcoa once employed about 1,000 workers here, but lost its best argument for renewal when the smelter at Badin shut down. Rep. Bill Owens, D-Pasquotank and a power legislator who chairs the House Rules Committee and is an Appropriations co-chair, said thatlast year, he would not have voted for the bill, but he asked Alcoa officials a year ago to do something to provide more jobs in North Carolina. "They haven't done it," he said shortly before joining the majority to approve the bill in committee. Also voting for it was Chairman Cullie Tarleton, D-Watauga, a former Charlotte broadcaster. Rep. Ruth Samuelson, R-Mecklenburg, voted no. Lots happening on this. Will post more when time permits. Will Yadkin River Trust get another chance? I missed last week's session of the House Water Resources and Infrastructure Committee, when the panel voted against a motion on a bill to create a Yadkin River Trust that might eventually purchase and operate Alcoa Power Generating's hydroelectric plants on the Yadkin River. Alcoa is seeking a federal license to continue operating the plants, but it has lost some support because it no longer has a large workforce at its Badin plant, a factor that helped the company get a 50-year federal license to operate the project back in the 1950s. Now the Perdue administration opposes the license at a time when the company is near the end of a long process to renew the license, and a bipartisan coalition of legislators is pushing the Yadkin River Trust bill. The Senate passed the bill overwhelmingly earlier this session, but the bill's fate is uncertain in the closing days of this legislature. But Committee Chairman Cullie Tarleton, D-Watauga, has scheduled another committee session tomorrow at noon in Room 1228 of the Legislative Building to consider SB 967. WEDNESDAY NOTE: ALTHOUGH THE MESSAGE TUESDAY FROM THE COMMITTEE WAS THAT IT WOULD MEET AT NOON, THE WEDNESDAY CALENDAR FOR THE LEGISLATURE HAS THE TIME AT 2 P.M., AND THE HOUSE CLERK'S OFFICE CONFIRMS THAT TIME. Last week Alcoa was happy with the result when the committee voted 8-6 against moving forward on the bill. But this week, proponents of the Yadkin River Trust were working to undermine Alcoa with a report associating toxic PCB levels in fish in Badin Lake with the Alcoa operations at Badin. The N.C. Water Rights Committee's public relations firm, MMIMarketing, released the following about the study. "John H. Rodgers, Jr., Ph.D., a renowned water quality expert with Clemson University, has released a new study that indicates there is a relationship between the polychlorinated biphenyls (PCBs) used at Alcoa’s Badin Works facility on the Yadkin River and the PCBs found in the fish and sediments in Badin Lake, a 5,300-acre reservoir that empties into the Yadkin through the Narrows Dam. This conclusion adds further evidence that Alcoa is the source of the PCB contamination found in the lake earlier this year. It is also yet another example of how Alcoa has been a poor steward of the Yadkin Hydroelectric Project, which includes four dams and powerhouses along a 38-mile stretch of the Yadkin River at High Rock, Tuckertown, Narrows and Falls Reservoirs in Davie, Davidson, Rowan, Montgomery and Stanly counties. "Alcoa, a multinational firm, has applied for a new 50-year license from the Federal Energy Regulatory Commission (FERC) to control, govern and sustain ownership of water flowing from the Yadkin River and continue overseeing its monopoly of hydropower generated by the Project. Opponents of Alcoa’s stewardship of the Project, including the Stanly County Board of Commissioners, have cited the firm’s poor environmental record as a key reason for denying the relicensing. As Badin Lake serves as the primary source of drinking water for Stanly County, a location for fishing and swimming, and an economic driver for the entire Uwharrie Lakes Region/N.C. Central Park and the State of North Carolina, this new link tying the PCBs in fish and sediment in the lake with Alcoa’s own operations strengthens that concern. "- There is a relationship between PCB congeners in sediments from the southwest arm of Badin Lake and PCBs in fish from the lake. - Congeners detected in the fish tissue provided further evidence of sediments as a source of PCBs. - PCB congeners detected in sediments from the southwest arm of the lake (near the Alcoa facility) have concentrations significantly greater (on the order of 10 to 100 times greater) than sediments from other parts of the lake. - PCBS congeners in sediments from the southwest arm co-occur more frequently with congeners detected in fish samples throughout the lake than do congeners in sediments from other parts of the lake. - Fish sampled from the southwest arm of the lake were consistently more contaminated by PCBs than fish collected from other parts of the lake." There's more. Presumably it will be up on the Web at some point but I didn't see it at www.ncwaterrights.org.